Whether traveling by car, train or plane, this computer bag comfortably carries your laptop while keeping all the essentials organized. 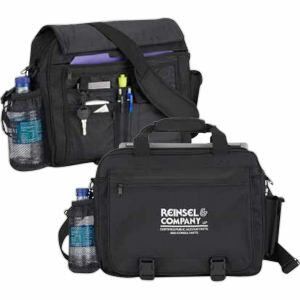 It’s made from 600 denier polyester material and features a suspended, padded laptop compartment (fits up to 17″ laptop), front compartment with pockets for cell phone, water bottle, multiple accessories and an adjustable / detachable, non-slip shoulder strap. This bag is certain to be a successful product. Any business that is looking to build awareness in the marketplace needs branded promotional items. However, the amount of options available can be overwhelming. Here are some quick tips that can serve as guidelines when picking your next promotional product. 1. Items That Reflect Your Business – When selecting a promotional item, whether it’s a t-shirt or a tumbler, think about what would best reflect your business and target audience. You want the item to always be in view and your logo to stand out. Thinking about the number of times an item will be used is also an important consideration. A good example would be a gym offering a promotional CamelBak® bottle. The item will stand out during a workout with the logo prominently displayed. 2. Get Trendy! – Be forward-thinking about what is trending right now in the marketplace. This will leave a great impression on clients and give you a cutting-edge image. Look at what products are hot in the marketplace, such as computer tablets. Finding a top-notch case or stylus pen could be the exact promotional product needed to showcase your brand and the image you are looking to promote. 3. Quality Before Quantity – The old saying “you get what you pay for” can be very true in promotional products. The goal is to find products that are of higher quality and will be used longer, so your company’s brand will have greater exposure. Taking advantage of buying products with a higher quality level will increase the consumer’s opinion and create an opportunity to showcase your business logo or message for a longer period of time. 4. Serve Your Purpose – Like an advertisement, your purpose is to serve the intended business goal and catch the user’s attention. You can think of a promotional product in the same manner. Are you trying to generate general awareness? Is the product for your top-end clients? Are you a new company that is trying to catch the attention of consumers with something fun and exciting? Start with your intended goal in mind to choose a promotional product and this will also help dictate your budget. 5. Consult a Pro – As a decision maker in your company, it’s your job to work with the proper promotional product professionals to learn what is available and how an item will look when finished. Talking with an expert in the promotional products industry can save you countless hours of research, thousands of dollars and the stress of choosing the wrong promotional product. Relying on their expertise will help you avoid the pitfalls of a trial and error approach and will help get you on the right track to selecting a winning promotional product! Previous How Will Technology Affect marketing To Younger Generations?